Prominent British artist Sarah Staton has created a permanent new outdoor artwork in the grounds of the University of Bristol’s Stoke Bishop campus. Edith and Hans is a 21st century folly: a ‘social sculpture’ for the public and students living nearby. 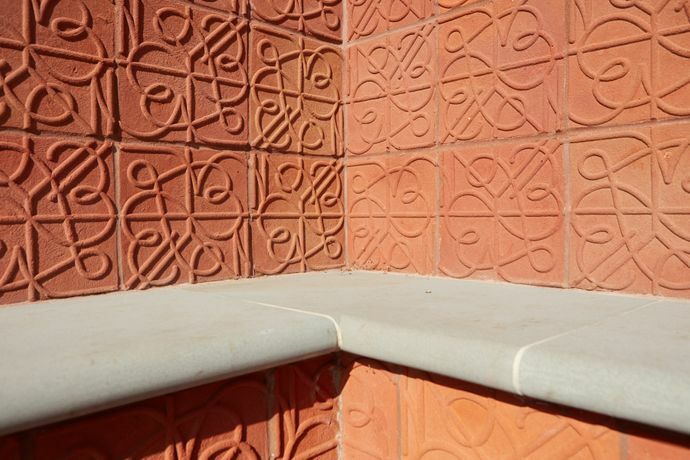 Located in a meadow between the Wills Hall and Hiatt Baker halls of residence, the new artwork is conceived as an ‘outdoor room’, somewhere between a ruin and an archaeological find. The highly textured sculpture is constructed from artist-designed wood-fired tiles, reclaimed red and blue bricks and pennant stone. The artwork will provide a place for contemplation, a meeting space, a site for picnicking and a locale for stargazing. Surrounded by Elizabethan meadow planting designed by the artist and orientated to harness the warmth of the afternoon sun, the sculpture offers long views across Avonmouth and into Wales in one direction, and in the other, a view up to Wills Hall past its inspirational chimneys and beyond to the stars. Staton’s practice combines design and art history influences with formal sculptural values, often mixing traditional craft techniques with cutting-edge technology. She draws together various influences in her work: in the case of Edith and Hans, making multiple references to both the historic site of the artwork and its contemporary context. This encompasses the formerly grand 19th century Downside House that was extended to become Wills Hall in the 1920s, and the five other halls of residence representing different architectural styles from across the 20th century that occupy the site today. The sculptures are named after the artist’s grandmother Edith and great uncle Hans who both had personal connections to Bristol. As Director of Bristol Museum and Art Gallery, Hans knew the Wills and Hiatt Baker families who were patrons of the arts and gave their names to the adjacent halls of residence. Staton was selected both for her ability to deliver projects of national acclaim and her approach, which creates site-specific sculptural commissions that are sensitive to their location and aim to encourage practical use. During the development of her proposal Sarah carried out extensive research into the history of the area, in particular the green spaces and buildings at Stoke Bishop. The tile design is formed like a monograph, composed of the symbols for major global currencies including the yen, euro, pound, dollar and rupee. The tile celebrates the University of Bristol’s diverse global community, and refers to the many countries across three continents Edith and Hans called home during their lifetimes. Edith and Hans was commissioned by the University of Bristol and produced by Field Art Projects. It is the first permanent commission to be delivered as part of the University’s Stoke Bishop public art programme and forms the second phase, following on from an artist residency by Melanie Jackson carried out in 2013. The public art programme at Stoke Bishop forms part of the University’s commitment and overall ambition for public art set out in its 2008 international public art strategy. It seeks to meet a number of objectives that include adding to its growing collection of outstanding temporary and permanent artworks, reinforcing the distinctive aspects of the different types of gardens and parkland surrounding the halls of residence. The programme is also creating distinctive new landmarks throughout the grounds that can become meeting and talking points, promote orientation and encourage new uses of overlooked spaces.